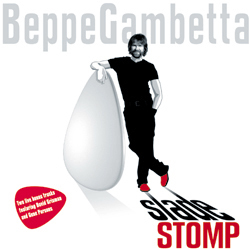 Beppe Gambetta "Blu di Genova"
Gadfly Records is proud to announce the release of Slade Stomp, the new release from world-class flatpicking guitarist Beppe Gambetta. Slade Stomp includes original compositions and arrangements dedicated to the “Masters” of flatpicking guitar that influenced Beppe’s music and career, both from America and Europe. “Slade” was the “mysterious” nickname of Beppe’s friend and mentor Charles Sawtelle (from the “Hot Rize” band) who died in recent years. Recorded completely by Beppe alone, the CD includes some solo “live” guitar tunes and some with overdubs (in one “orchestra” tune Beppe played 110 tracks!). There are also two bonus live tracks featuring David Grisman and Gene Parsons. Born in Genoa, Italy, Beppe began his musical training in a classical orchestra before drawing on traditional European and American guitar techniques to develop his own original style. In 1977, he formed the acclaimed Italian bluegrass band Red Wine. Later as a dynamic solo performer he toured Europe, America, Canada, and Australia while rediscovering, teaching and promoting flatpicking and other great, but less known, guitar forms. Beppe has collaborated with masters of the acoustic scene (Gene Parsons, Tony Trischka and many others) on ambitious projects such as reviving and contemporizing the energy of the “brother” duets with guitar master Dan Crary.